My last foray into ELF’s eyeliners was not a successful one. About a year ago, I picked up a couple of the liquid liners they do and HATED them. 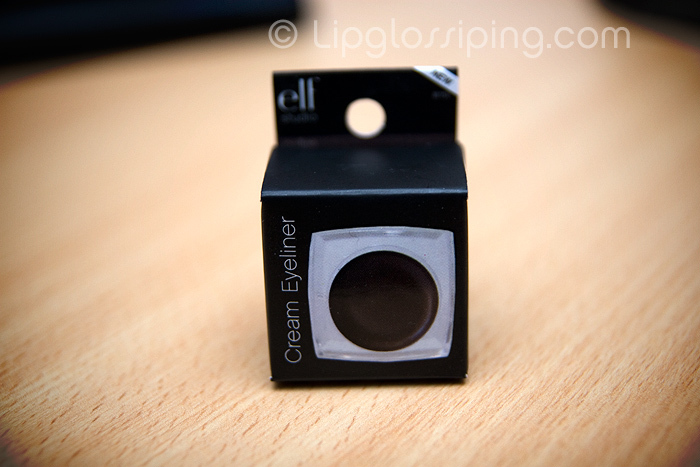 Scratchy and lacking in pigmentation made them a huge fail for me so I was ready to be disappointed when I accepted the offer to try a liner from the new ELF Studio Cream Eyeliner range. The packaging fits in nicely with the rest of the Studio line, the jar is plastic with a solid, chunky feel. The lid screws on with a satisfying click when it’s fully tightened. Lightweight and portable, it’s not the sleekest eyeliner in the world, but it’s fully practical. The texture of the liner is *incredibly* soft, perhaps a little too soft. When I dip my brush, the fibres sink downward straight into the product which makes it a little hard to stroke across the surface without picking up too much product. A couple of times, I’ve picked up a whole clump of eyeliner on the brush instead of an even coating. You can see the tip of the brush sinking straight into the product in the shot above. Whilst this might mean it takes a little more care to load your brush, it makes for the smoothest application of any liner I’ve ever used. And I’ve used a lot. Note, that this only applies to this particular shade as I know texture can vary between products in the same line. 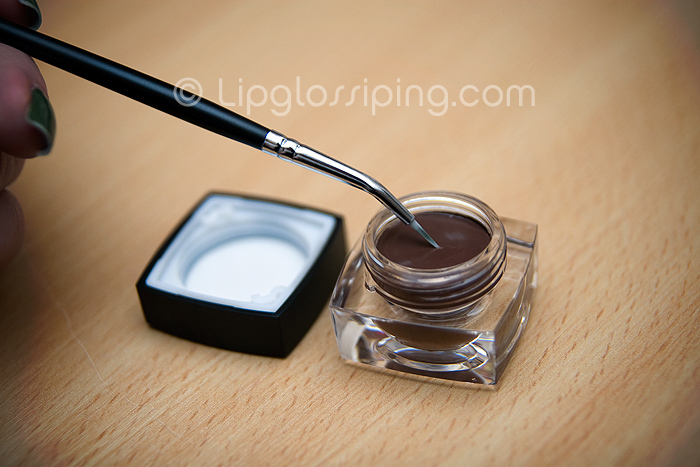 Pigmentation is medium, I needed to go over the line twice to build it up to my desired strength, but when a liner glides as smoothly as this one does, it’s not a problem. 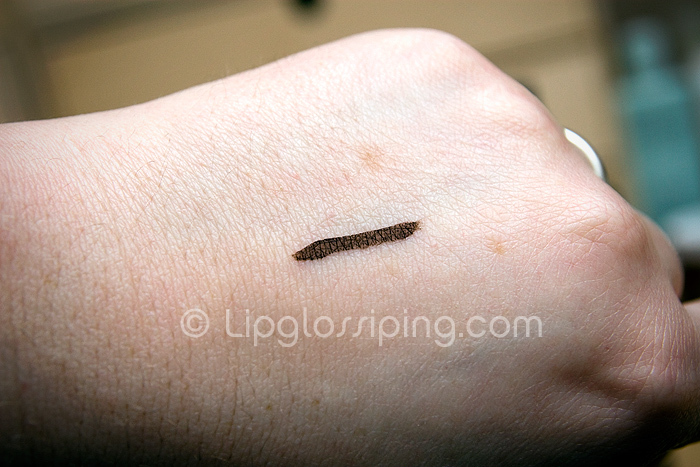 The above swatch shows 3 swipes of the liner. It takes about a minute to set before becoming truly transfer proof. Even on my hooded eyelid it stuck fast for hours, by bedtime the line had faded to about half it’s original intensity, but the fading was even. 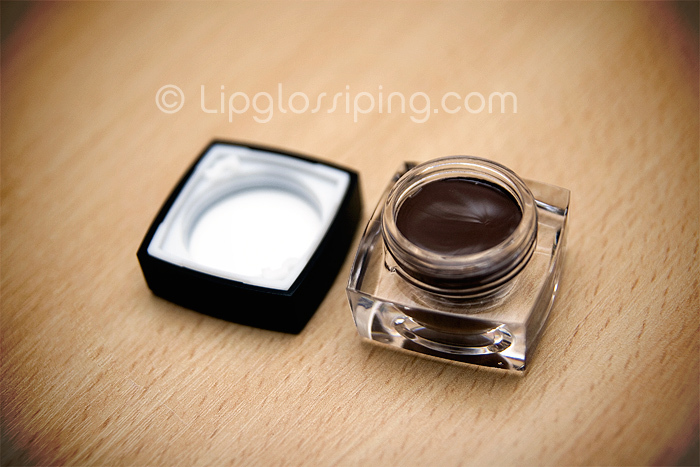 I’ve also used it as a cream base which worked really well thanks to it’s super-soft texture. Blending was a delight and I love wearing it under greens to create a more ‘old gold’ kinda shade. I haven’t noticed it partcularly increasing longevity on eyeshadows though, so I still combine with a slick of eyeshadow primer underneath. 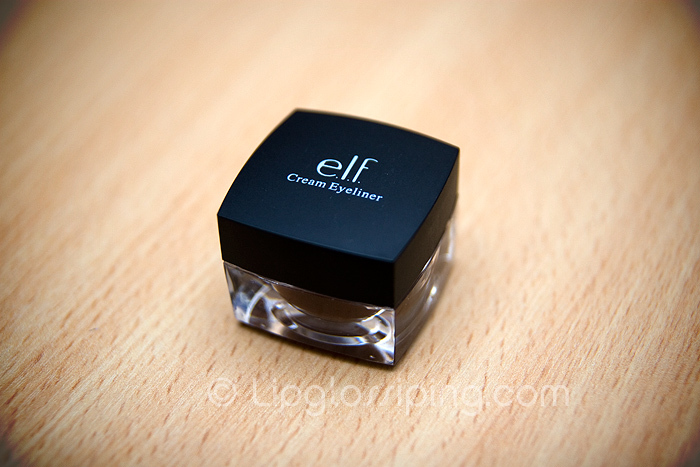 I’m amazed by the quality of my ELF Studio Cream Eyeliner, and at £3.50 you really can’t go wrong. I actually started doing my makeup with gel/cream liners a few years ago… and apparently time makes me lazier because now I only use liquid and pencil (liquid on the top lash line, pencil on the bottom lash line). I like your angle brush – where’s it from? I just ordered these but haven’t had the chance to try them out yet. I bet the ivory would be great as a waterline color (or as a base). Now I’m excited I grabbed them during my last haul! How could I miss these? I got a few items from the studio line a month ago and I wish I had seen these because you got me really interested. I love gel liners and I also love the Elf studio line. Well, in my next order I know what to get! I’m not too fussed on having to build up the intensity so much with my gel liners, but I LOVE that it makes a clicking noise when the lid is screwed on properly. More brands need that with their gel liners, maybe they wouldnt dry out so fast! I have been curious about these! Great review. Thank you! I’m so glad it appears to be good. I just order one in black last Friday (of course it’s still processing my order on the website). I started using gel liners about a year and a half ago and I went with Makeup Forever Aqua cream liner in black and i love love loved it. It was the closest thing I’ve ever had to a holy grail item. However it def started to dry up over this summer (after a year) as much as I tried to fight it and moisturize it with eyedrops. So since this fall I’ve had to go back to cheapo pencils and majorly missing it, but just haven’t been able to afford a $20+ eyeliner. I tried HIP once cause I heard so many rave reviews but it failed miserably in my eyes, so when I saw this I had to try. ANything for cheap gel liner again! I’m glad I ordered the Coffee and the Midnight with my last order!! I already have it in black and I really like it!! I will soon post a review on them in my blog!! 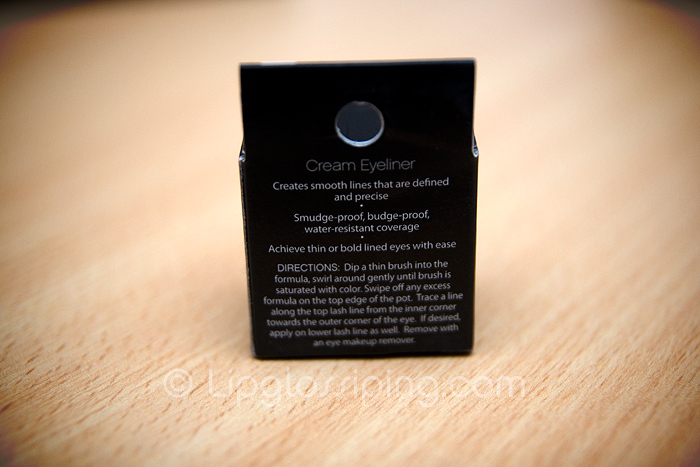 i have just bought the cream eyeliner in midnight shade and i was worried about the worth of the product!!! Love that you included the detail about having a hooded lid and that the eyeliner didn’t transfer to the brow bone while wearing it, because my right lid is hooded and I constantly have a problem (even with transfer-proof liners) with the liner ending up on the underside of my brow bone. And what a price point… I bet the ingredient lists aren’t all that different from some of the other major brands that do similar things. I didn’t know ELF had cream liners. I don’t own any ELF products; is there that anything you recommend? I love this brown! Looks like there’s a slight sheen to it too, which is always lovely. I’m definitely going to try this one out!